Being a landlord is the biggest small business in the world. There is tremendous opportunity being a landlord but also a lot of responsibility to maintain your property and collect your rent each month. On average landlords own their rental property 5 years which means they have 60 payments to collect while they own the property. In Chicago alone there are over 45,000 evictions each year and the total back rent owed to landlords is in the Billions yet, most landlords never do anything to go back and collect that money owed to them. In this episode you learn the path to not being the average landlord and leaving money behind following an eviction! You learn the path to collecting back rent. 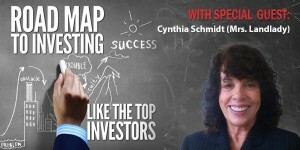 Cynthia Schmidt is dedicated to helping landlords succeed! She and her husband Gary have been landlords for over 20 years! They know the feeling of tenants making excuses and trying to find creative ways to not pay rent! They have also gone back to court with their own tenants and have over 90 satisfied judgments and collected over $200,000 in back rent. Did you enjoy this episode? Leave us your comments below, share this post with your social media contacts & please leave us a review in I-Tunes. Is Section 8 Good For Investors?